Many worlds. Many lives, infinite possibilities. Sixteen year old Sasha Lawson has only ever known one small, ordinary life. When she was young, she loved her grandfather's stories of parallel worlds inhabited by girls who looked like her but led totally different lives. Sasha never believed such worlds were real - until now, when she finds herself thrust into one against her will. To prevent imminent war, Sasha must slip into the life of an alternate version of herself, a princess who has vanished on the eve of her arranged marriage. If Sasha succeeds in fooling everyone, she will be returned home; if she fails, she'll be trapped in another girl's life forever. As time runs out, Sasha finds herself torn between two worlds, two lives, and two young men vying for her love - one who knows her secret, and one who thinks she's someone she's not. 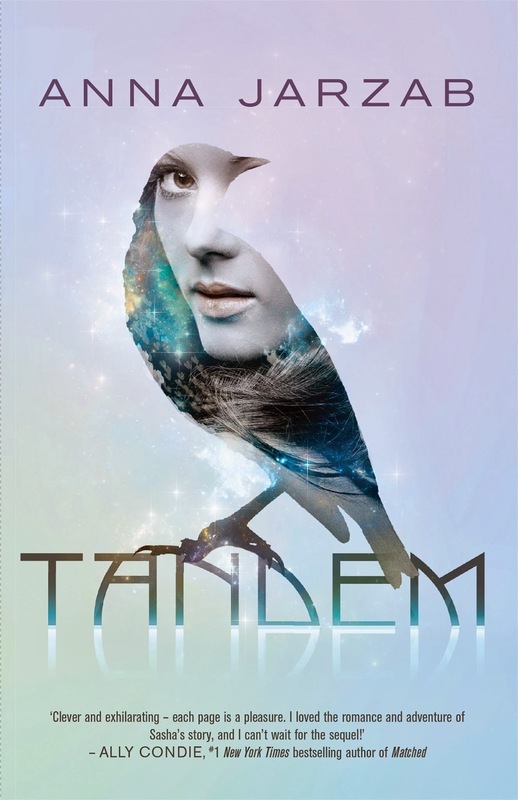 Tandem is a riveting saga of love and betrayal set in parallel universes in which nothing, and no one, is what it seems. Sasha Lawson is an only child. An orphan who lives with her grandfather, a theoretical scientist who loves his granddaughter dearly. As long as she can remember, she's had a crush on Grant, a boy who has never acknowledged her existence. But when he approaches Sasha and invites her to be his prom date, surely there must be a catch. Little does Sasha realise that Grant isn't feeling himself lately... That's because he isn't Grant. His name is Thomas, he works for the King's Elite Service in the United Commonwealth of Columbia in Aurora, and he's an Analog. Sasha is forced through the Tandem, the thin veil separating Earth from Aurora. Operation Starling was proceeding exactly as planned. Sasha is being held in a large basement, with the simple silver bracelet Grant had given her. The bracelet, known as an Anchor, allows the wear to travel between the parallel worlds, and impossible to remove. Sasha's capture comes as the unrest in Aurora begins to escalate. A group of revolutionary terrorists are calling for the monarch to step down, fighting for their democratic rights. The Libertas group are suspected to have taken Princess Juliana, only months after her father was shot. Juliana was the rightful heir of the Commonwealth of Columbia empire, with a nation depending on her leadership. Juliana is Sasha's Analog. The two girls a mirror image for one another, and if Sasha wants to return home, she must become the Princess and deceive the nation. Her only ally is Thomas, the boy who snatched her from her world. Thomas was the close, personal guard of the Princess and has taken it upon himself to protect Sasha. But in a society built on secrets and lies, Sasha's hand has been promised to the young rival Prince of Farnham. Playing the role of doting fiance, Sasha forms a bond with the royal who's partnership could stabilise the country. With emotions high, Sasha must remain in character, or face the threat of the General of the King's Elite Service looming over her. But Sasha seems to know more about Julianna than she realises, a bond through dreams linking the two girls. Torn between Thomas and Callum, Sasha has more pressing issues. Seeing the world through her bond with the Princess, may unravel a more secrets than anyone expected, putting not only Sasha's life in danger and the promise of returning home now seemingly impossible. Tandem was incredible. A brilliant blend of science fiction, suspense and romance. I was highly anticipating it's release, the premise of a parallel universe isn't all too common in young adult, and it certainly didn't disappoint. Sasha had lost both her parents, and raised by her estranged grandfather, who she now couldn't imagine her life without. She's the quiet achiever who doesn't rely upon her peers, but longs for a more exciting life than the predictable one she seems to be stuck in. Little does she realise that her entire world is about to change, literally. The teen is thrown into a parallel universe against her will, where she is almost a carbon copy of the Princess. Based on science fiction, Anna Jarzab created an incredibly engaging storyline that readers will invest in. Although Tandem doesn't contain long and boring scientific explanations, thank goodness, readers will need to be observant within the first few chapters to gauge the storyline as a whole. The characters are all interconnected, but Sasha shares a special bond with her Analog through a tether. Visions she assumed were vivid dreams, were events as seen through the eyes of her Princess counterpart. It allowed the storyline of both Sasha and Julianna to be told through two different points of view, through the one person. Slow to begin but imperative to the storyline, once Sasha is taken through the Tandem, I was complexly engrossed. If this is the future of young adult science fiction, then readers are in for a brilliant ride. But be warned, it ends in what could be seen as a cliffhanger, I for one can't wait for the release of Tether, book two in the Many Worlds series. It was in the beginning, it'll certainly keep you on your toes. But once you settle into the storyline, it's actually really, really good. Ooh, I like the sound of this! Particularly that cover (why am I so obsessed with covers? Wait. Don't even attempt to answer that one). I can't even think of the last parallel universe book I read. Hmm... I should definitely fix that. Keeping this one on my radar! I can't recall having read one either, my husband thought the premise sounded a lot like the old TV show Sliders. You're probably too young to remember that one. Being the first in the series, it was an incredible start, building up the parallel world of Aurora. And the cover is just delicious. It's slow to start, but if you like a mild science fiction that is focused on relationships, you'll enjoy this one. I'm looking forward to reading more about the rebellion, and hoping it features heavily in book two. I think you'll really enjoy this one Dre, of course it's about us and our superpowers. It's about time we were recognised. Most young adult science fiction is pretty boring, but this one not only kept my attention, but completely drew me in. I gotta admit, this sounds amazing Kelly! I just love the parallel universes! I always wonder whether our dreams are actually other universes or realms, you never know hey? Lovely review, I'll have to check this one out for sure. The romance is a little flowery and predictable, but the actual storyline is really intricate and once I got into it, I just couldn't put it down. Definitely check it out.